The Last Judgement, together with the Sistine’s Chapel ceiling are one of the most renowned spots in the Vatican. There are long queues for tickets, but it is possible to buy tickets online in order to avoid the cues. Full price tickets for individuals cost 16 euro and 8 euro reduced. An additional 4 euro will be processed if you buy your ticket online (but that way you beat the cues). Audioguides are available and cost 7 euro. One audioguide can be used by two persons. 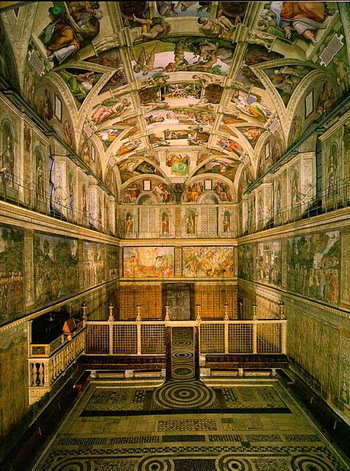 The Vatican Museum is organized in such a way that you have only one route for visiting and you end up at the Sistine Chapel approximately one hour into your visit (after passing among others through Raphael’s Rooms). The museum is open every day except Sunday with the exception of the last Sunday of the month when entrance is free. Closed: 1 January, 6 January, 11 February, 19 March, Easter, 1 May, 14-15 August, 1 November, 8 December and on Christmas. There are English guided tours available. They cost 32 euro and leave three times a day in the summer (departing at 10:30, 12:00 and 14:00) and twice during winter (10:30 and 11:15). They last about two hours and can be pre-booked. Reaching the Vatican Museums from anywhere in Rome is quite easy. With the Metro line A, you can get off at Ottaviano – S. Pietro – Musei Vaticano stop and from there you will need to walk for seven minutes. Bus no 49 has a stop just outside the museum entrance. Buses no 32, 81 and tram line 19 stops at Piazza del Risorgimento which lies close to the Vatican Museum as well.